The glorious teak coach house on this work boat seen in Fowey tells of a different past, perhaps a harbour master or police launch or even a naval launch. Although now fitted with some ugly industrial machinery, her graceful lines and quality of construction are still apparent. It seems not only sailors are drawn down to the hard at Swanwick, this group of motorcyclists from Southampton had gathered there for the start of a fine day out riding their classic motorcycles. 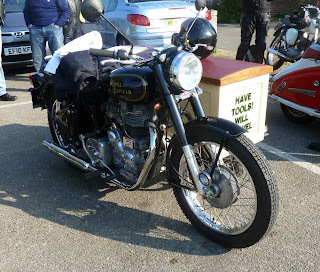 Many years ago I started riding motorbikes on an early 1960's Royal Enfield Crusader which was a 250cc single cylinder, it was old, neglected, unreliable and had been painted a horrid emerald green by one of the many previous owners. It was certainly nothing like this 350cc Bullet which is immaculate and complete with sidecar, which has a charming "Wallace & Grommet" quality - Have tools will travel. 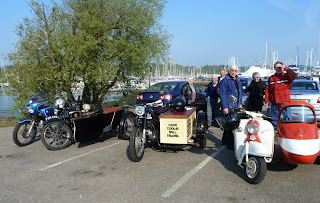 Sometimes you get the timing right, on Sunday I rowed back from Hamble on the last of the stand. 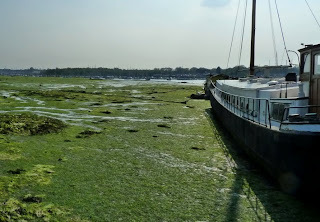 In the river the tide drops a little after high water and then, well stands for a couple of house before picking up the ebb. This is more noticeable at springs and Sunday was no exception. 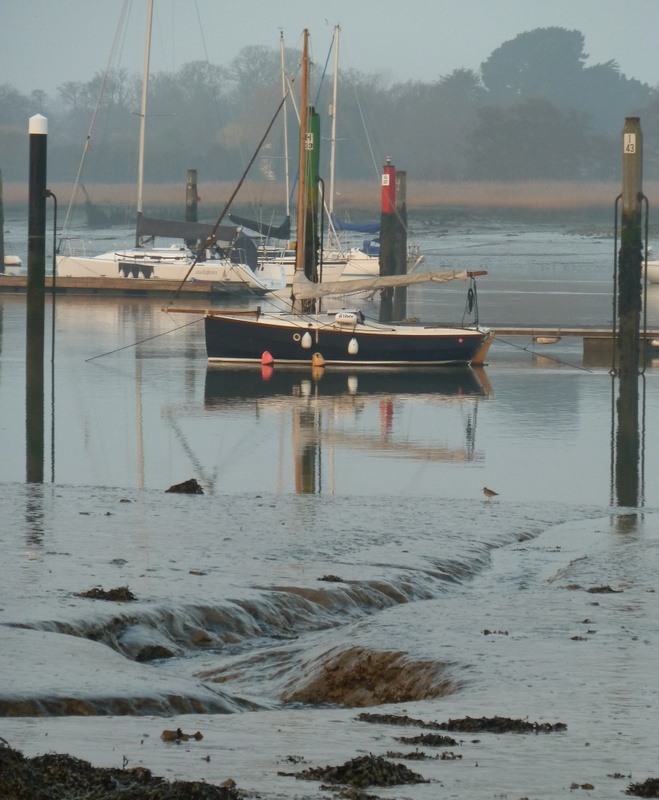 A couple of hours after I'd put the boat away in the garage it seemed like the river has disappeared. 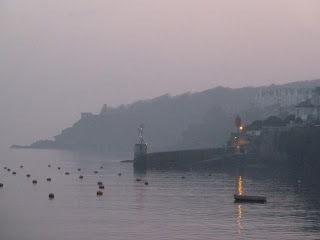 The sun was out, the morning was still, flat calm, with just a hint of early morning mist. The yacht clubs and boat yards were alive with polishing, sanding, anti-foul painting, all those other last minute jobs and of course boats being lifted back into the water. 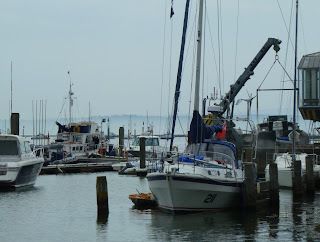 On the scrubbing piles, boats were waiting for the tide to drop for the afternoon low and a good clean up. 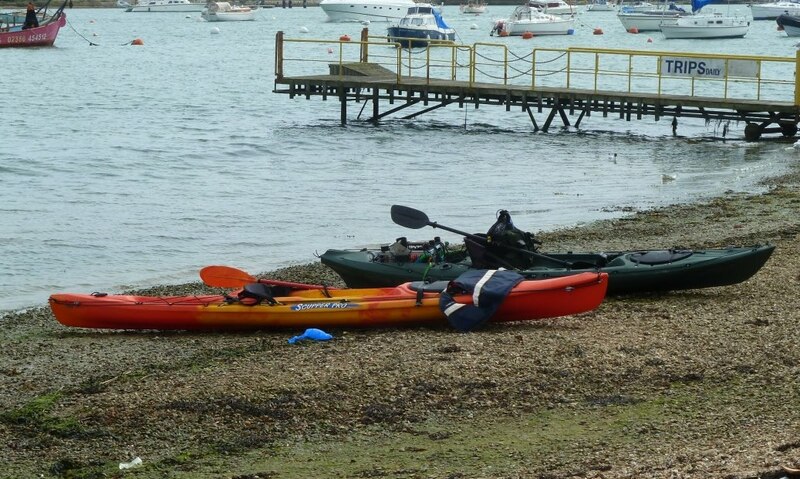 Some canoes were drawn up on the foreshore at Hamble at the weekend, this type of open top kayak are very popular. Some are used by canoeists, for pottering or exploring and as a stable platform by fishermen. Then I spotted this, fitted with a small outboard it must be one of the smallest motorised canoes around, that's what I want, mind you the motor kill cord would have to be a hair trigger! 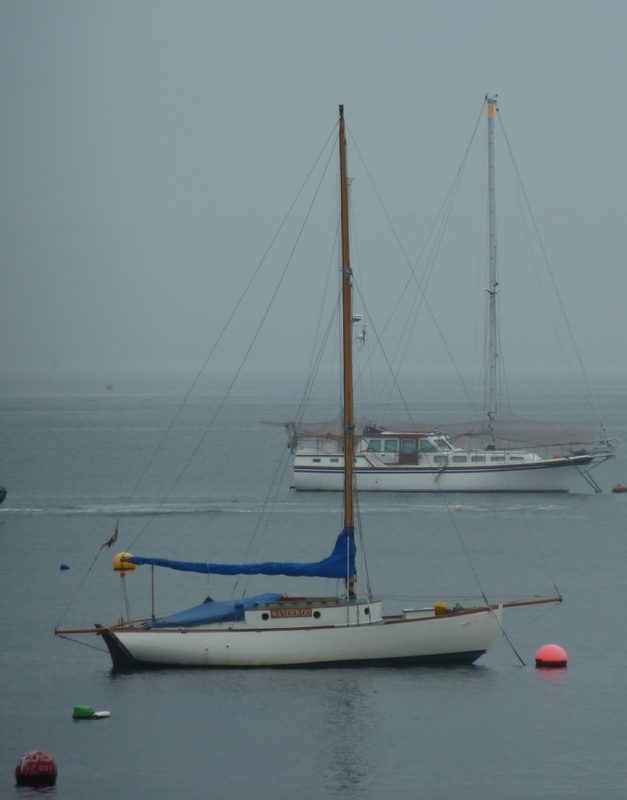 One of the things I like about visiting the west country is the opportunity to look at some interesting boats, like this double ended Colin Archer type out on the moorings off of the town quay in Falmouth. 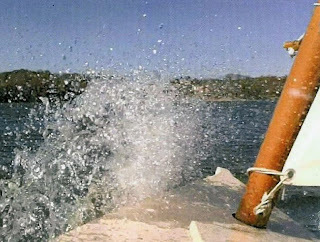 Several designers have drawn up examples of this style of boat based on Colin Archer’s famous rescue boats and the boats have been constructed in a range of materials ranging from wood to ferro-cement. 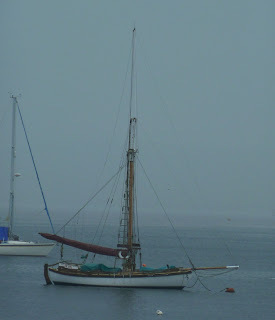 This one was too far away to see any details but she is a handsome boat and just look at that topmast, flying a brightly coloured topsail would be great for light airs. 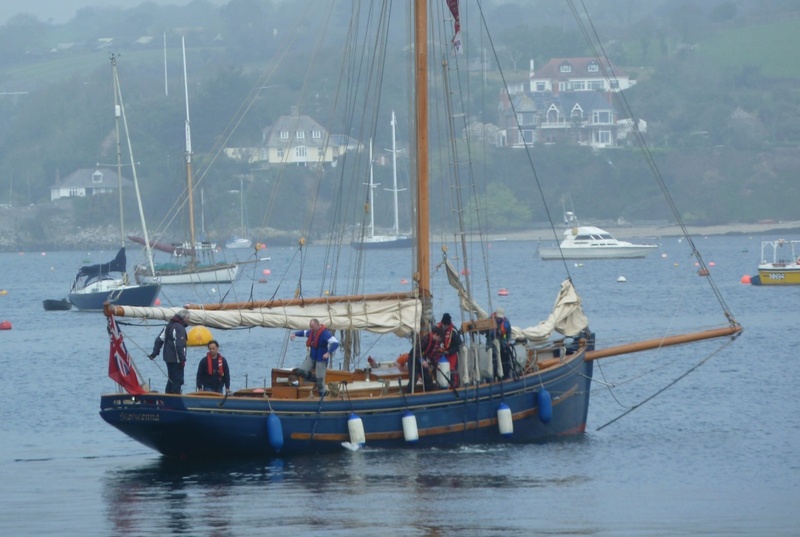 This cute cutter looks like it has a sporty edge, with short bowsprit and bumpkin, the top section of the Bermudian mast supported with jumper stays, she echo's back to pre war days. 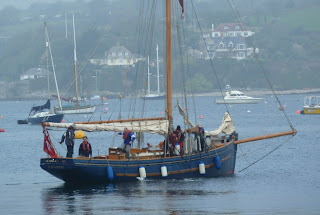 Further down the harbour pilot cutter Morwenna was maneuvering in the marina beside the National Maritime Museum, the last time I saw her was in Cowes for the start of the Fastnet race and I see from her web site that she will be competing again this year. 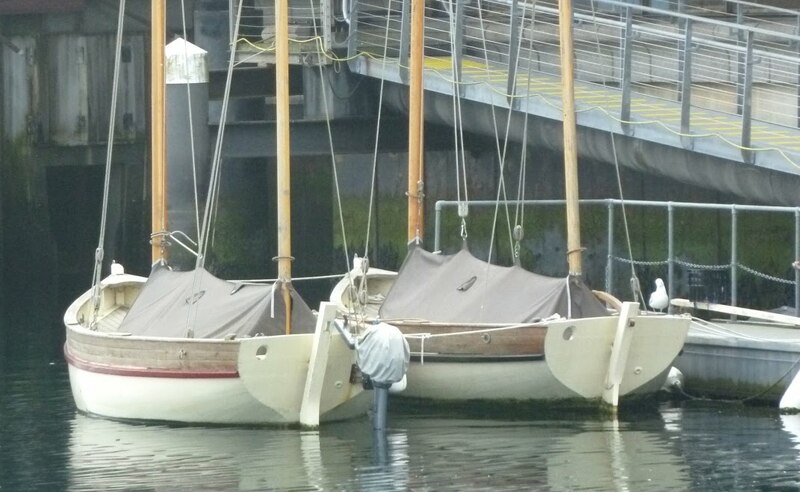 These two luggers on the Maritime Museum pontoon were built by students of the Falmouth Marine School based on a local boat Veracity which was built by J. Blewett of Newlyn for a Mr. Paul Humphreys of Mousehole in 1902. 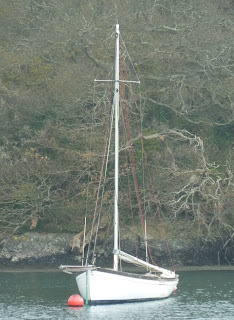 Veracity was 33ft LOA but the new boats were scaled down to 22ft, last time I looked they were for sale. 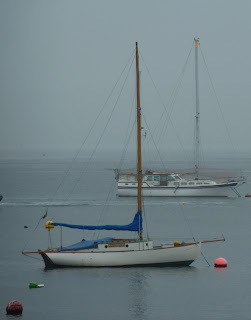 Further up Carrick Roads at Mylor some of the still working boats were to be seen, to preserve the fishery oyster dredging is only allowed under sail so there area has a number of working boats like this one. 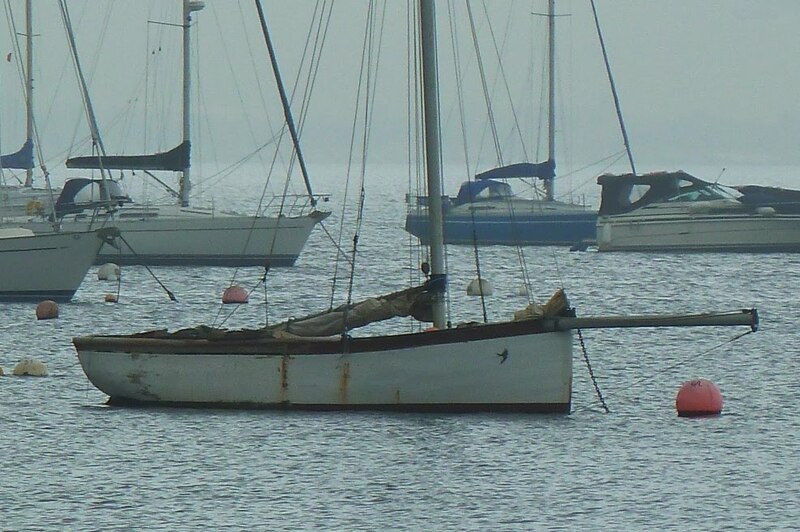 The mast looks like it's been reclaimed from a modern yacht and put to good use. 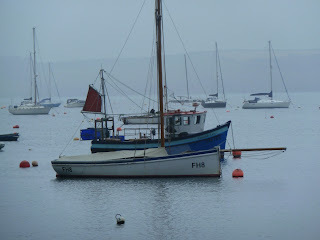 FH18 looks fast just lying to her mooring, racing has always been a facet of the local fleet, with working boats carrying a cloud of sail in the summer races. 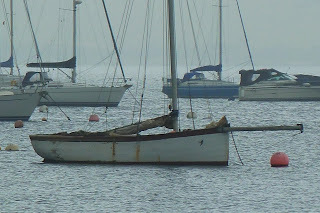 Other boats seem less well cared for, or perhaps it's just the result of a busy working season and a winter which has dragged on for too long, in the meantime she waits patiently for a lick of paint and a scrub to start the new season. 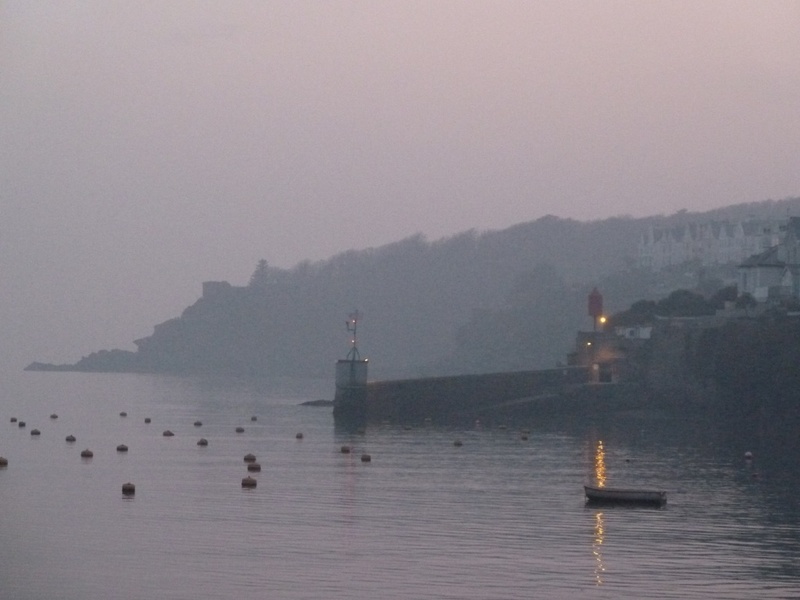 Even in the height of summer a holiday in the west of England doesn’t guarantee good weather, so we were remarkably lucky when we took a few days break at the end of March. 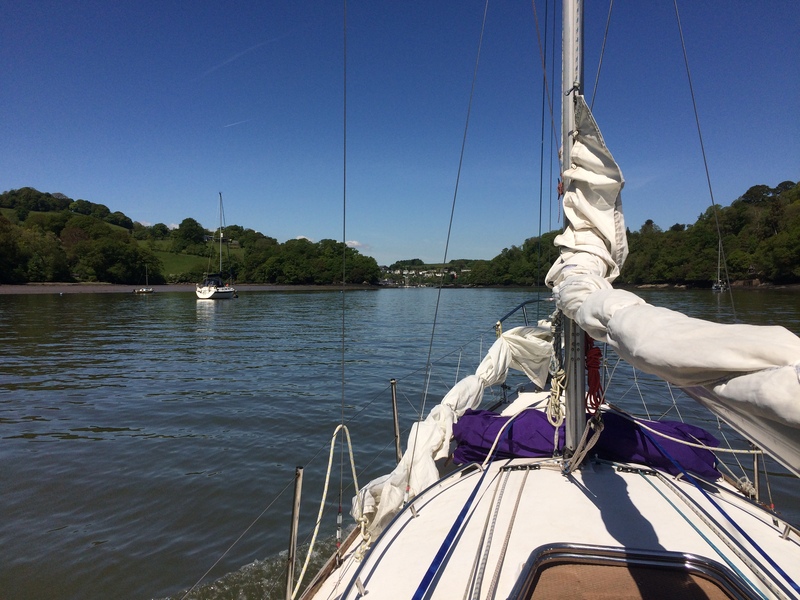 While colleagues at work were still heading off to the Alps to catch the last of the snow we headed west to Fowey and were rewarded with sunshine and summer time temperatures. 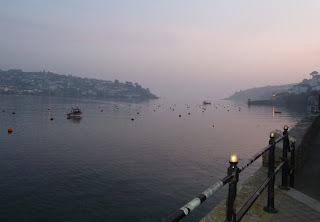 Fowey was just getting going after the winter so most of the boats were still ashore but the outlook was no less delightful. 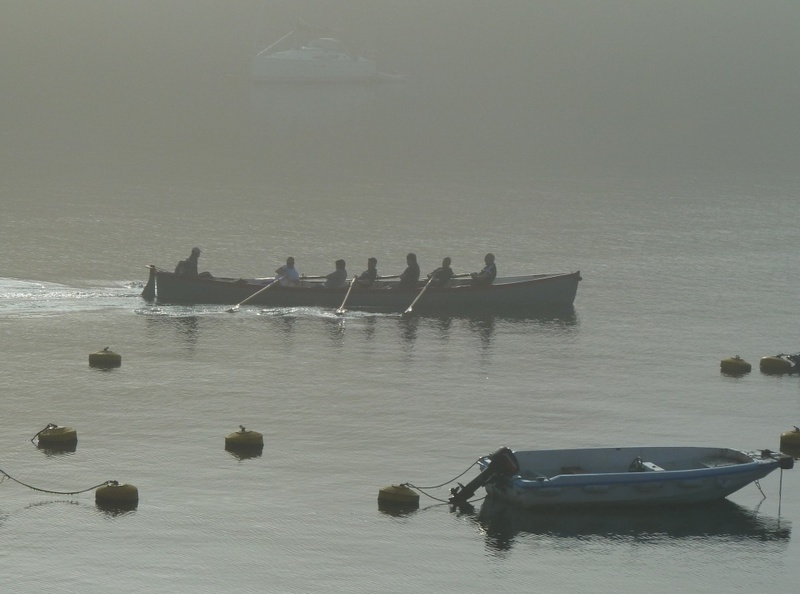 The settled high pressure brought with it clear sunny days, but in the mornings the steeply wooded river would be misty until the sun broke through, The local gig teams didn't seen to mind, here they are out early on Sunday morning rowing past the moorings under our balcony. 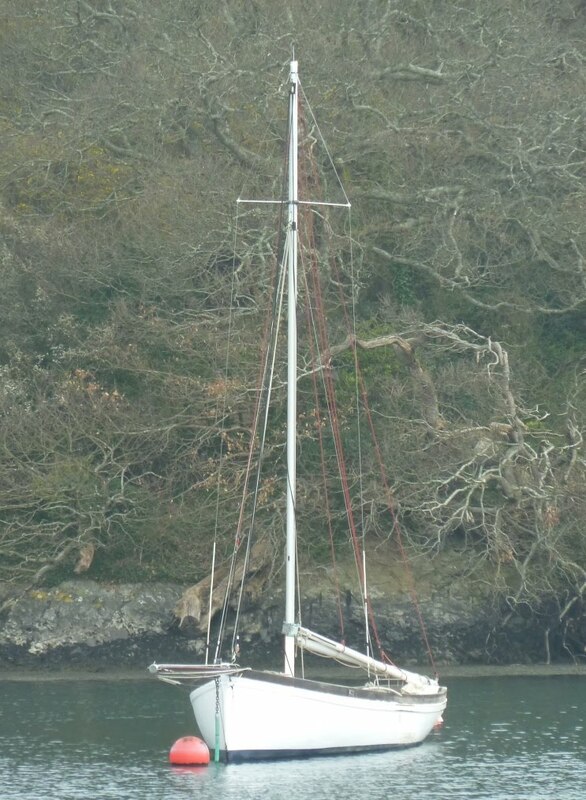 Back in March I wrote a tongue in cheek post about a senior Laser sailer only to get an equally tongue in cheek email a couple of days later from the man himself . It turns out that David not only sails but has been a keen rower for many years, seen here in the Cosine Wherry which he built some 16 years ago from plans published in a book called Rip,Strip & Row. 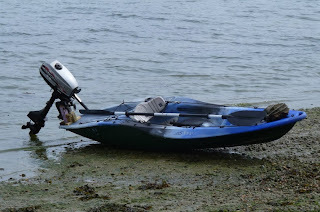 Apparently Laser sailing and other things got in the way of rowing for a few years, but last year David started rowing in earnest often from Hamble up to the Horse and Jockey pub at Botley. Actually I'm surprised we haven't seen each other on the river, but maybe that's because rowers face backwards! Over winter David took his Wherry along to local boat builders Casse Tete Marine who did some remedial work and installed these immaculate thwarts. David signs his email the "Old Bearded Laser Man" - I thought about calling the post the "Saga Sailer Saga!" Look forward to seeing you on the water David if I every get round to doing some rowing this spring!! Melon Seed Skiff "Nancy Lee" was featured recently on 1001 Boats, pictures and details were kindly sent by Roger Rodibaugh who sails Nancy Lee (named after his wife Nancy) in Lafayette, Indiana. It was a great surprise when a card dropped through the post box a few days ago, Roger and Nancy have created a card using images of Nancy lee with the accompanying words which absolutely sum up a cold but exciting winter sail . I'm getting a bit behind with postings as we're now in April. 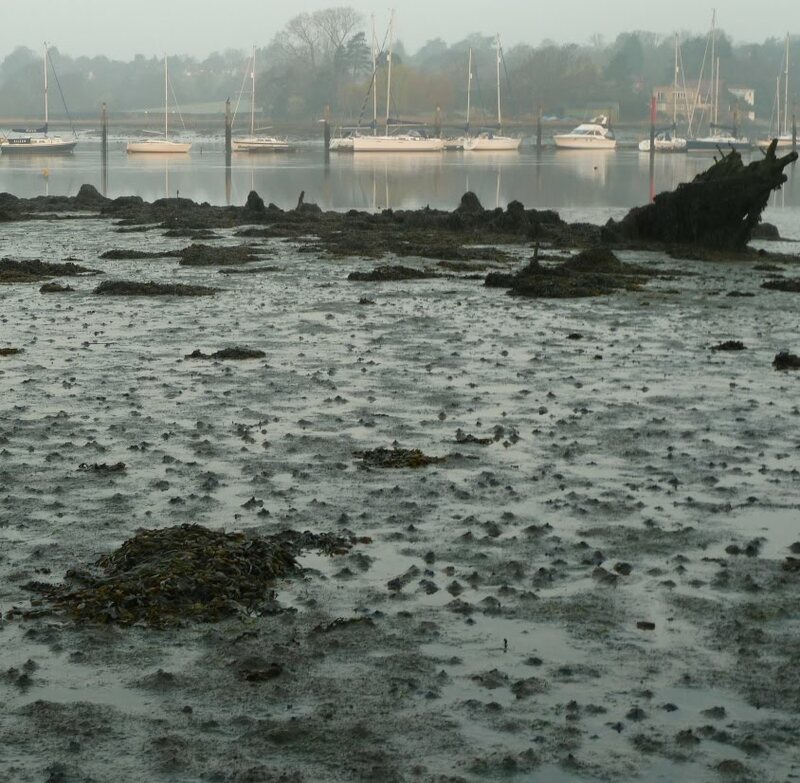 With the combination of the March Spring Equinox and the moon being at it’s nearest point to earth in over 20 years ,we had some big tides not to mention stunning views of the moon thanks to the high pressure keeping the night time skies clear. 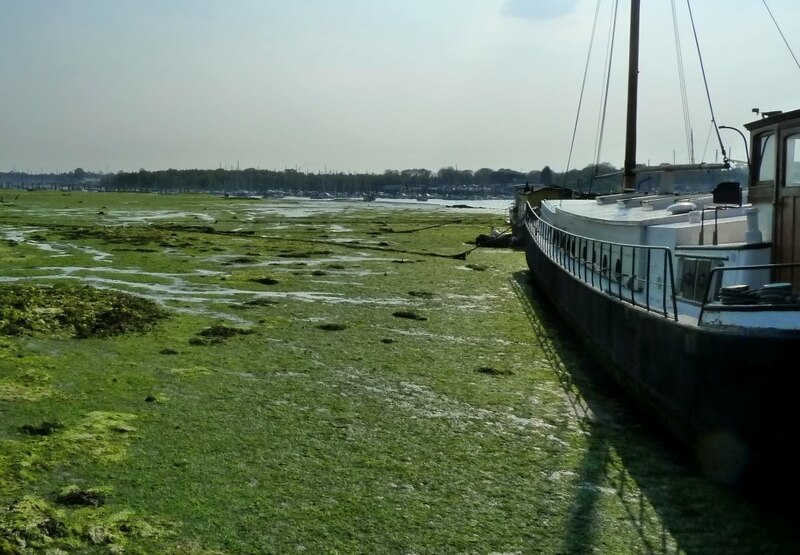 The combination of high pressure and light northerly winds means we haven’t suffered the very big high tides that we’ve seen in past years, but the low water levels have revealed parts of the river seldom seen. 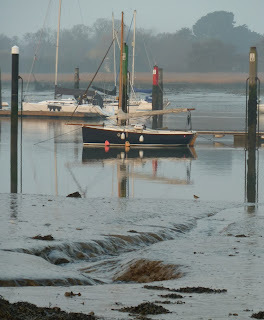 Sadly I had forgotten to take my camera along for my early morning run and by time I returned the tide was flooding, but there was still a goodly extent of Hamble mud to be seen. 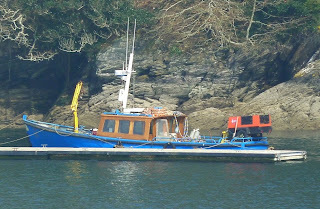 This Cornish Shimper is a new arrival on the river or at least new to this mooring. Although a modern boat in all respects, designed by Roger Dongray in the late 1970’s or early 80’s she has strong links back to work boat heritage and looks right at home on her mooring at low water springs. 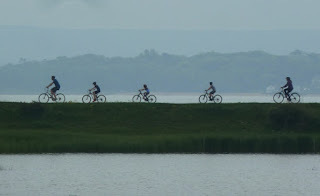 I don’t normally pay much attention to statistics around the Burseldon Blog, taking the view that I write about things I like and if people read them all well and good. 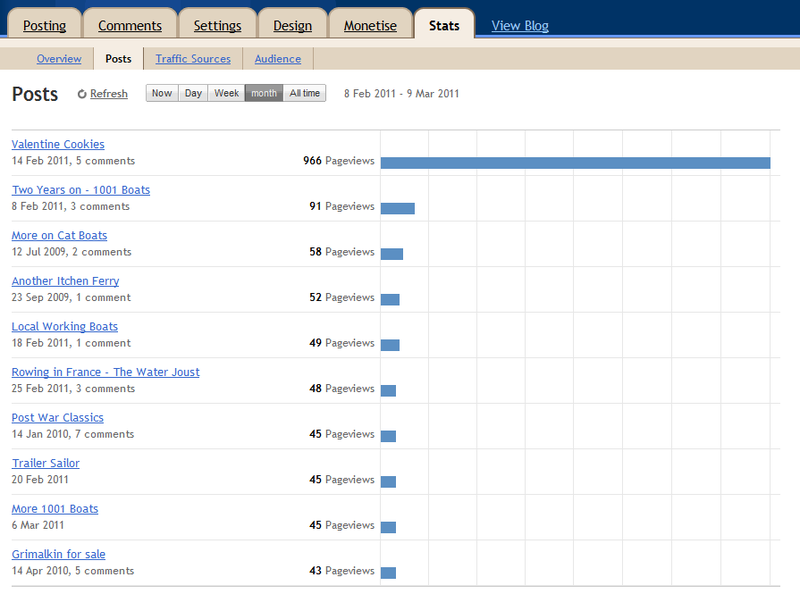 But on the Blogger dashboard recently my curiosity got the better of me. The information available is incredible, it’s possible to see which pages have been viewed, how often, which countries are viewing, even the source of viewer (presumably the previous site they visited). All very interesting stuff; and no doubt there are people who understand how to use all this information to increase the numbers of people visiting a site. But the thing that caught my eye was the page view summary for February below. It shows how many times each of the pages of Bursledon Blog was viewed during February and what a surprise; Valentine Cookies was far and away the most viewed page – and not by a small margin, but with nearly 10 times as many views as the next most popular page. There’s an old saying “lies, dam lies and statistics” well maybe we should add “and the truth about Burseldon Blog readership”. 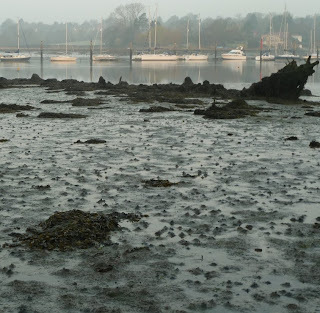 Not wanting to waste an opportunity to increase the readership watch out for upcoming posts on “Bursledon Bikini”, “Solent Stockings” and not forgetting “Hamble High Heels”.